I truly make an effort to never post a recipe unless I have tried it myself, but saw this gem yesterday and was totally smitten. 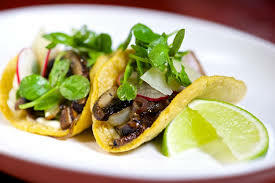 The next month is crazy with travel and deadlines, so I won't have a chance to give these meatless tacos a go for at least another three to four weeks. By then would I remember? The only solution was to share the recipe in a blog post which I can come back to in mid-July when there is more time. For many years I was a vegetarian. Then I married a total meat lover and began having children. I felt my husband had a right to the food he preferred and made the choice that our children should grow up being allowed to make their own decisions about what they liked. I have always done my best to expose everyone to a wide variety of food - meat dishes, vegetarian, vegan, fusion, cultural dishes - you name it. I wanted them figure out what they loved. Needless to say, it didn't always agree with what I loved, but that's a price I was willing to pay. To fill the void, I often choose to indulge in unique vegetarian dishes when eating out. Creativity is a real plus for me, so when I saw thes unique tacos from the chef at the Pink Taco in Los Angles, I just had to share it. The next time I'm in town visiting, I will definitely be giving this restaurant a try. I'll add my personal feedback later, but for now I can only offer you the picture and recipe posted by Sam Anguiano on the Food Republic website. If you try making these before I do - please leave your comments below. Truffle aioli: Place all ingredients into a food processor or blender and process until well-combined. Reserve in the refrigerator until needed. 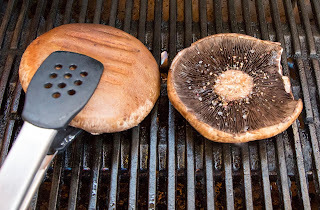 Grilled mushrooms: Preheat grill to medium high heat. Remove stems from portobellos and discard. Brush mushrooms with olive oil on all sides and season with salt and pepper. Place mushrooms onto hot grill and cook for 4-5 minutes, then turn over and cook for another 4-5 minutes. Remove from grill, rest for 10 minutes, slice them into 24 even pieces about 1/2-inch thick and set aside. Caramelized onions: Heat a large sauté pan over medium high heat and add olive oil. Add onions, salt and pepper and sauté for 3-5 minutes. Turn heat down to medium and continue to cook. Move the onions in the pan until they have turned a nice light brown color. (Check out our easy guide to caramelizing onions here) Once onions are caramelized, add fresh orange juice and continue to cook for 15 minutes. Tacos: Warm all tortillas and hold in a tortilla warmer or in aluminum foil. Add 1 tablespoon of truffle aioli to the center of the tortilla from end to end, creating a line. Place 2 slices of grilled mushrooms on top of truffle aioli. Place 1 tablespoon of caramelized onions on top of the mushrooms, spreading them evenly. Place thinly sliced radishes on top of the onions and thin parmesan cheese slices on top of the radishes. 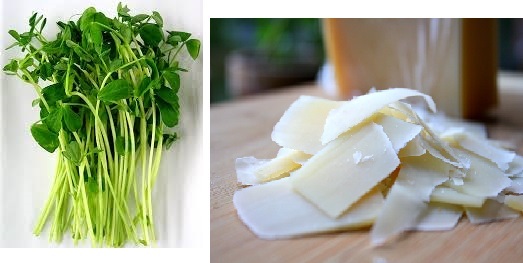 Top with 4-5 sprigs of pea shoots and serve.